Advertisements can be a short-lived and expensive solution to marketing your brand. Have you thought about branded products? Swag, tchotchkes, or promotional products are a key element to adding a special sizzle to your marketing plan. Whether internal or external use within your organization, there are many ways to make an impact regardless of your budget or turnaround time. 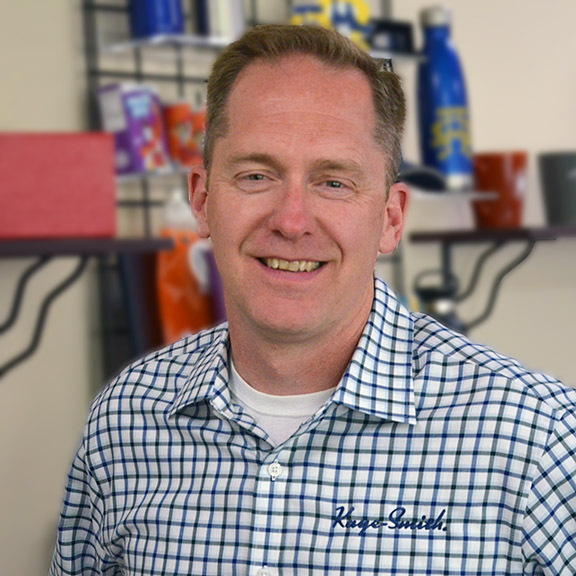 Kaye-Smith offers our same attentive client-focused service from our Pacific Northwest location along with a dedicated team of researchers to bring you the latest trends and offerings in the promotional product marketplace. Our team scours for suppliers at national trade shows, bringing together the best products with the latest production methods and trends. Our longstanding vendor relationships ensure preferred pricing. Creative Merchandise Director and branded merchandise expert Patti Morisset offers these tips for success on including branded items in your marketing plans as the year comes to an end. • For milestones. The holiday season is a time of celebration, and branded products are a great way to add a special element to your employee parties or service award recognitions. What are Patti’s go-to favorites? “For service recognition, you can’t go wrong with a watch or a nice piece of luggage. The employee will always remember you gave it to them. Adding your logo is not necessary for these items, but adding a branded ribbon or luggage tag will show you went the extra mile to show appreciation for them,” she explains. If you’re going for trendy, Kaye-Smith offers several gifts for the tech lover from phone accessories and attachments to cleaning kits, bluetooth speakers and ear buds. • For new or existing employees. A token of appreciation for their dedication to your team is a thoughtful gesture. Our favorite ideas are drink ware and apparel. These takeaways put your company and logo on the road with them for more exposure. • For clients. Sending clients a thank you gift for their business is a common practice in our industry. Go the extra mile with a custom gift basket that leaves a lasting impact. Our sales department can help you choose the perfect customized items like cookies with your logo or baskets with premium items like Mrs. Field’s cookies, Harry and David, and Omaha Steaks. • Employee apparel: Any time your employees will be in the public eye, considering their apparel should be top of mind. Whether your team is headed to a trade show, charity event, or spends time regularly outside the office with clients, our branded clothing products will take your overall look to the next level and give a professional impression. We offer the latest fabrics and decoration trends. • Booth or table setup: In addition to apparel, we also specialize in outfitting your company’s table or booth setup with quality banners, tents, tablecloths and more to complete your overall look and appearance. • For new product launches, adding a branded item to introduce it can help legitimize it and make it feel official. Leaving a pen or branded notepad behind after client meetings will keep you top of mind. A calendar is one of our favorite items to give to clients, ensuring a full year of visibility on their desk or in their office at a low price. • When attending local parades, charity or sponsorship events, a small leave-behind item is a way for customers to remember who they saw and want to follow up with. Interested in more? Browse our catalog here and for more ideas visit our Pinterest page here.